Finding the perfect pair of hunting boots should be at the top of your hunting gear list. Boots serve more than one purpose in the field. Of course they can provide you with the comfort that you want when you are hunting but they can also provide you with the protection that you need when you are hunting. As the temperatures drop keeping your head covered and your feet comfortable is very important to your overall ability to regulate your body heat. Of course they can also keep your feet dry as well in wet conditions which help you to feel more comfortable. There are a wide range of hunting boots to choose from and many of them are fairly priced. Investing in a good pair is well worth the investment. They will help you to stay out longer and enjoy the hunt far more. If you do not want to invest a lot of money or you just cannot invest a lot right now there are some pretty decent budget options out there. Where will you use the boots? Clearly if you hunt in the mountains you will need rugged boots that can handle hiking through rocky terrain. If you hunt in flatter conditions than you do not have to worry about thick craggy rubber soles. Climate also plays a role. If you typically hunt in the cold than you need to be shopping for hunting boots that are also cold weather boots. If where you hunt most of the time is more temperate than you can get away with boots that are less expensive because they are not rated for cold weather. There is a nice range of materials to choose from when it comes to hunting boots. In many cases the best hunting boots are a combination of several of the different materials. Understanding what the materials have to offer is a good place to start your search. Having a good understanding about the materials will help you to narrow down your options. This textile is advanced and takes all of the best benefits of nylon but adds the insulation that the nylon lacks. It is widely used in the uppers of many boots and as an insulator. It is very great for ventilation and is completely waterproof. 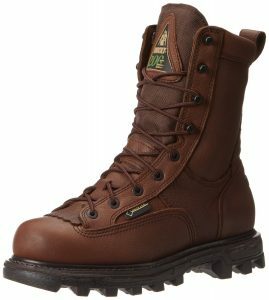 These are great boots that are waterproof and fully insulated. They are constructed from Nubuck leather, have not only Gore-Tex to help keep the weather out but they are also insulated with Thinsulate. They have a nicely padded collar that will help with comfort! These leather and Gore-Tex boots are great for warmer weather. They are not insulated but are very durable and comfortable. They are relatively lightweight which adds to the comfort. Rubber is the best option out there when it comes to repelling water. It is usually used for the soles of many of the best boots on the market for that exact reason. Boots that are made entirely out of rubber can be inflexible, but they offer superior protection from water and support. Rubber is a traditional material that can be found in many of the boots on the market today. We looked at a few pairs of boots that were made from rubber and we found two that we thought that they were best. These are very flexible boots that are made of a natural rubber compound. These tall boots will do a great job of protecting your feet and your shins. They offer an easy on and off feature that make them a real pleasure to wear. Reinforced toes make these a super safe option. They have a breathable lining that is made of mesh for added comfort. They are completely waterproof which would be great for hunting in swampy areas. Leather is a favorite material for hunting boots because of the durability. As long as the leather is treated it can be waterproof. Leather is favored because it can really stand up to use and can literally last you a lifetime. Leather boots get more comfortable as time goes by and you wear them more. We choose 2 styles that we thought were best. These are heavy duty boots. These are heavy duty hiking boots that lace up. They offer a great amount of comfortable wear. It has a nice heavy duty outsole. These are nice tall leather boots that will protect your feet and ankles. They are mid-calf boots which is nice to protect your shins and lower legs from brush. This is one of the most popular closed-cell foams on the market today. It is usually used as a liner and for the uppers because it is lightweight and versatile. Even though it is not breathable at all, it is very warm and completely waterproof. It gives the same protection that rubber gives but for only a fraction of the weight. These boots are scent proof and waterproof and a really aggressive outsole to offer sure footing. They would be a good option if you are going to be dealing with a wet area and you want to ensure your feet stay dry. These are also tall boots that have a neoprene component. They are durable and will serve you well in a host of hunting climates. They would be a good option for wet areas, snowy areas and even to fish in. These may seem like an outdated option, however boots that utilize this material still show some clear advantages. The first is that canvas boots are very breathable and are somewhat lightweight. They dry rather quickly when they get wet because they allow for great airflow. Canvas can be sealed by the manufacturer or right at home to give it better waterproofing qualities. Canvas boots are usually more affordable, but can be heavier than the other options available. When it comes to a well-insulated, flexible, and attractive material for your hunting boots, suede is your best choice. Suede is soft and premium leather and it keeps your feet very warm. It is also flexible which makes it more comfortable than some of the other options out there. It is essential to treat suede to repel water because if it gets wet and is untreated, it can stain or rot. It is normally used for the upper parts of boots to help aid in the flexibility and comfort. Sometimes it is used to line the boot because it is great in cold conditions to keep your feet warm. It is being replaced by Gore-Tex because these boots are not so good when they get wet. They are flexible, warm, and attractive, but they can be heavy. This affordable option is one of the newest and most advanced options in the market. The webbing or nylon mesh is used in many of the best hunting boots available. It is extremely durable and is very lightweight. It can resist water and also allows for optimal ventilation. Boots with nylon mesh are very light and flexible. They are not good with keeping your feet warm because they do not offer the warmth protection because of their breathable construction. Many of the best styles use this durable and water resistant material with some insulation so that it can offer both the warmth and water proofing needed for almost any terrain and under any weather conditions. Closed-Cell Foam is very sturdy and lightweight. It is a great cushion material for your feet. Mostly used in the insoles of hunting boots and can be tailored for different purposes. The technology is also moisture-proof, springy, supportive, and light. All of the top hunting boots use closed-cell foam for their insoles. Waterproof boots utilize closed-cell foam because it is great for absorbing some of the moisture that is formed because water proof materials are usually not that breathable. Now that you know that various options that are out there and the great technological advances that are available, you can make an informed decision. We provided you with a great selection of different boots made from different materials to help you find the boots that will meet your needs best. Most people decide to buy two different types of boots if they hunt year round. Most hunters will have boots for summer and boot for winter. Having a couple of pairs of boots also can help to extend the life of your boots by being able to switch off during the seasons and of course having the right boots for the season makes them more comfortable wot wear. The best hunting boots have combined the best materials available to offer you a pair that is durable, versatile, water proof, and comfortable. The last thing that you want to do when you are out there about to score your biggest game ever is worry about your feet hurting or being soaked. Any pair of the boots that are listed here would be a good bet for any hunter that wants to stay comfortable during the hunt!